Tiger Bill Reviews Drummer's Complete Vocabulary as taught by Alan Dawson Book and 2 CDs from Alfred Publishing. In 1975 Boo McAfee attended a NAMM convention and when Barrett Deems proclaimed to be "The World's Fastest Drummer, Buddy Rich was there to ask "Oh Yeah! What machine did you use?" Although Boo was only nineteen years old at the time, he never forgot Buddy's comment. Craig Alan, to finally answer Buddy's question, "What machine did you use?" Unless you've been playing in a closest for the past few years, I'm sure you've heard about the "World's Faster Drummer" contests that have been raging across the country since Boo's Drumometer first came on the scene. Although these Drumometer driven extreme sports drumming events are wildly popular, the drum community seems split on whether they are good or bad for the art of drumming. Detractors point out that there is much more to drumming than chops, while proponents point to the Drumometer as a useful tool for improving chops and the WFD contests as a great way to popularize the art of drumming. To the detractors, I say lighten up. Sure there's more to drumming than chops but chops are an integral part, even for those drummers who don't aspire to be the next Buddy Rich. Personally, I don't feel that there's anything wrong with drummers wanting to improve their speed and endurance. Or with drummers who want to test their speed against other drummers. Healthy competition is part of life and it offers a great incentive to make everyone strive to do their very best. As a former student of Joe Morello's, I can tell you that Joe always had us on the metronome. He wanted us to develop the best chops we possibly could. This, Joe said, would allow us to become more creative players without our chops being the limiting factor. And that's exactly how I feel about it. Back in 1978, I wanted to be in the Guinness Book of World's Records as the world's fastest drummer but, at that time, there was no machine to measure speed accurately. 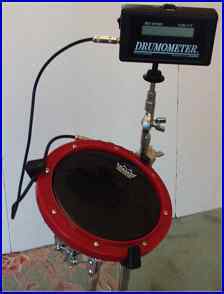 So you can imagine my excitement when I first heard about the Drumometer - especially in conjunction with the world's fastest drummer and the Guinness Book. I thought, hey, here's the machine I've been waiting for! At the same time, I was anxious to find out how accurate the Drumometer really was. So I got one, set it up in my drum studio, and started playing with it. Here's what I discovered. The main "brain" of the Drumometer is housed in a small black box with a few buttons and an LCD on it. You also get a connection cable, contact trigger, double stick tape, and two wing nuts. The instructions state that you can attach the contact trigger to an acoustic drum, a Remo Practice Pad or an electronic drum. The included cable is used for hooking the Drumometer directly to an electronic drum but for the other setups, you'll need to attach the cable to the contact trigger, after taping the trigger to the surface of the drum or pad head. It is also recommended that you screw the Drumometer itself onto a cymbal stand and the included wing nuts can be used to tighten the unit to the stand. The reason that Steve decided to go without a battery compartment was two fold: 1) The batteries rarely need to be changed, as they can last anywhere from 18 to 30 months depending on frequency of use, and 2) Steve didn't want the batteries flying out should the Drumometer take a tumble, which one of my three kids has already tested by knocking it over! Instead of attaching the enclosed contact trigger to one of my existing pads, I opted for a Remo Pad that already had the trigger built into it. 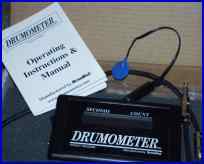 The Drumometer itself has three basic controls; an on/off switch, an up/down button, and a reset button. When you turn the unit on, the digital timer and digital counter LCD become visible. Let's say you wanted to know how many beats you can play in 10 seconds. You simply set the digital timer to 10 and start playing. The Drumometer begins registering your strokes from the first tap. After 10 seconds the Drumometer stops and the digital counter registers the total number of beats you played during the 10 seconds. When you're ready to try again, you push the reset button and start playing. The Drumometer tracks you as you play for another 10 seconds. You can easily increase or decrease the amount of time you want the Drumometer to track you for, up to a max of 99 seconds, by using the up/down button. To save on battery life, the Drumometer is programmed to shut off if not used for a period of five minutes. For my first test, I set the Drumometer to count down for 10 seconds while I ran some triplets against it, using a metronome to verify accuracy. Next, I tried some sixteenth notes. The results? It was dead on accurate. I tried to see if I could screw it up by throwing in accents while playing a single stroke roll but, again, the Drumometer tracked every note. Next, I played accented double stroke rolls and paradiddles and even a buzz roll in an attempt to mess up the machine. The Drumometer never dropped a beat. I was very impressed! I'm sure any DrumHead will have as much fun as I had, running various exercises against the Drumometer. And for competition, it can't be beat. Never again will your friend be able to boast how fast he can play because you have the machine to prove it. As I said earlier in this article, Joe Morello was (and still is) a fanatic about practicing with a metronome. He believes it helps drummers keep track of the progress of their chops. As I verified the accuracy of the Drumometer, I was reminded of a story Joe told me concerning a workout session with Louie Bellson. Somehow, Joe and Louie got into a thing where they were trying to see who could play the fastest single-handed 4-stroke ruff. If you've ever tried this yourself, you know how difficult it is to hear if you're actually playing three or four notes, especially when you're burning at top speed. If Louie and Joe had access to a Drumometer back then, they would have easily been able to verify their speed - minus the messy carbon paper. While they played, I measured their speed on the Drumometer and recorded their scores. I repeated this measurement at each weekly lesson. Between lessons, students were instructed to practice the exercises each day at home. I repeated these exercises and kept a record of each student's score each week for six months. When I compared the final results, I found that each and every student had increased their starting speed by a minimum of twelve beats per minute. My most improved student raised his speed by 24 beats per minute! Could my students have made this much of an improvement using a plain old metronome? Maybe. But I feel the Drumometer is what gave them the added incentive to raise the bar each week. It's one thing to play along with a metronome at high speeds, trying to hear whether you're actually making each note. It's quite a different experience to play while the Drumometer keeps track of the notes for you. The instruction booklet that comes with the Drumometer makes an important point that bears repeating: "CAUTION: Should you begin to feel pain in your hands or arms, stop immediately to reduce the risk of muscle damage." It goes on to say that you should "stay relaxed." How many times have I told you to stay loose? (At least at the end of every article I write!) I'm glad to see Boo stress this important point in his instruction manual. So what do I think of the Drumometer? It's a great device for verifying both speed and accuracy plus it's a ton of fun for beginners and pros alike. The best educational tools are those that let you have fun while you learn. Since this review was originally done, a second version of the Drumometer has become available and, I'm happy to announce, they took my suggestion and added a metronome to it! And it also is now capable of clocking you for up to 15 minutes at a time. Very cool! The new list price is now $199.95, not cheap, but the Drumometer is a terrific tool with topnotch accuracy. Plus, it is currently available online at discount! By the way, since writing this original review, I entered the NAMM World's Fastest Drummer Competition and won for fastest hands and set a record for fastest feet while I was at it! Lots of fun!